Project obstacles and solutions: Grace Church launched a new campus in Fishers, Indiana in January 2017. 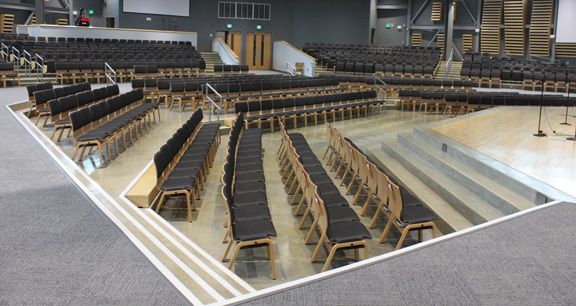 The new building included a tiered worship center with both removable chairs and fixed, theater-style seats. Shiel Sexton served as the general contractor for this project. The finished floors of the auditorium included carpet and a hard-trowel concrete finish for the tiered areas where the theater seats were bolted to the concrete. The floors represent a growing trend in church construction, which emphasizes both flexibility in seating and durability in flooring. Since the concrete was used as finished flooring in the sanctuary, special attention was paid to both the finishing and the concrete mix that was used. The key to a smooth finish is a fine paste and a mix that will not set up too quickly. Special attention is also required of the water-to-cement ratios to avoid plastic shrinkage cracks in the concrete. IMI QC/QA designed a concrete mix that used a fly ash as a pozzolan material to enhance the cement paste. A mid-range water reducer was added to the mix to control bleed water and plastic shrinkage. The auditorium seats 800 people. The steps, tiered risers, sunken forward section and speaker's platform were all finished with a hard-troweled concrete. For more information on using concrete as a finished floor, contact the sales representative for the concrete location nearest you. Click here.